That Mary Early’s work qualifies as post-Minimalist is plain. By first building components and then balancing them against one another in roughly circular structures that have not been mapped out in advance, she largely allows early decisions in her process regarding the form of her pieces to dictate the final shapes of her assembled work. In turn, the whole obscures the parts. In her latest exhibit at Hemphill Fine Arts, these parts include levers, cross-shaped bars, and elongated rails she has hooked together to form circular fencelike structures. But her process is not so obvious, nor its outcome so clinical, as to permit Early’s work to be reduced to Minimalist impulse alone. The laminated wood segments attached to each other here with cheesecloth strips and coated with beeswax are warm, even seductive, and preserve signs of the artist’s hand. Though her assembly process might indicate serial repetition and anonymous production, the symmetry in her work is natural, and the generation of that symmetry is organic—marked by variation, as with snowflakes, or, more appropriately, honeycombs. Untitled (wreath), 2008–10, best exemplifies the tension between manufactured object and biomorphic form in her work. Dozens of long growths emanate from its center point. Along the structure’s round perimeter, the crossbar ends of each radial interlace to build a regimented edifice. It could be the remains of some primitive marine organism; its organic character is enhanced by the luminous glow of its beeswax, darker in color than the pollen-yellow beeswax of two other works here. 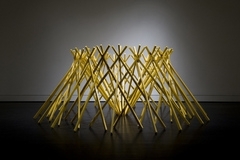 Untitled, 2009, is more architectural than skeletal; this piece seems to suggest that she is resisting the biomorphic quality of her practice: that it merely emerges, almost accidentally, from the prefab units she creates. But where would nature be without similar serendipitous processes, whereby flaws coalesce into organization?